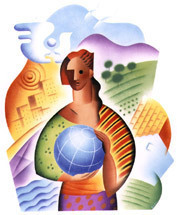 International Women’s Day 2014 – One Billion Hungry: Can We Feed the World? Closing the gaps be they knowledge gaps, yield gaps or gaps in access to productive resources is clearly an urgent challenge and one that could bring about transformational global change, and one that fits with the theme of this year’s International Women’s Day, “equality for women is progress for all”. The CGIAR has acknowledged the lack of gender targeted research across their work. They have discovered that context, an understanding of location-specific social and geographical dynamics, is critical to successfully designing and implementing agricultural technologies for women rather than relying on assumptions and gender myths. In developing and distributing orange-fleshed sweet potatoes (OFSP), CGIAR have learnt that gender plays a large role in land use and adoption. Through local partners, CGIAR have shown women how OFSP can boost household food security and nutrition but also raise women’s standing in the community. The probability of adoption of OFSP is now highest on farms where women decide which crops are grown and those jointly managed by men and women. Moving beyond assumptions and reducing inequality between men and women will, as evidence suggests, have a large impact on progress, be it in reducing poverty and hunger or economic development. The International Livestock Research Institute have suggested some practical steps that can be taken to reducing gender inequality. Although focused on livestock value chains, these actions could apply across other agricultural sectors. Optimising women’s involvement in agricultural development activities can boost incomes, rural family welfare and the bargaining power of women. We hope that this International Women’s Day will not only continue the work of breaking down gender barriers and dispelling myths but will result in greater opportunities for women around the world to improve their productivity and livelihoods. You can follow the action this Saturday on Twitter #IWD2014.